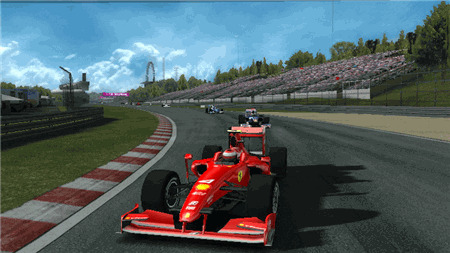 F1 racing is ready for its dramatic debut on the Nintendo Wii with the highly anticipated F1 2009. There have been a large number of racing video games over the years, from Need for Speed to Gran Turismo, but the world's most passionate racing series, Formula 1, has been missing from the video games scene for several years. That's all about to change though with the release of F1 2009 in November 09. The game includes all of the F1 racing circuits faithfully recreated, and a car tuning system that lets you prepare your car for the challenges of each race. The car tuning system offers both armchair fans and F1 fanatics the option of either basic or in-depth tuning modes that will satisfy the racing mechanic in everyone. The game boasts highly sensitive but realistic car handling, where pit strategies and car set up will play an important part in your racing success or failure. F1 2009 incorporates official F1 racing rules where teams have to declare their pit stop strategies prior to each race. Hard and soft compound tyres affect the handling and performance of your car, and according to the rules, you'll have to use both types of tyres during each race. The type of tyres you use first, the track and weather conditions, and your chosen pit strategy will be crucial factors in winning races. The game will have a number of gameplay modes including Race Weekend, Career mode, Quick Race, Championship, and a host of mini games. Race weekend will take you behind the scenes of a complete racing weekend, where you'll compete in the practice sessions, qualifying rounds and the race itself. Career mode puts you behind the wheel of one of the Formula 1 teams, where you'll be tasked with achieving the team's objectives for the season. For the smaller teams this may be picking up a few points during the season or just finishing races, while for the bigger teams it's winning the world title or bust! Quick race features a single player or split-screen multiplayer racing mode that lets you jump straight into the action. Unfortunately there's no online play which is a real shame, as this is where so much of the fun is to be had in modern racing video games. Having experienced online play with games like Mario Kart on the Wii, it's a real disappointment that we won't be able to play this one worldwide. Nonetheless, with its numerous gameplay modes, beautifully recreated race tracks and deep car set up tools, F1 2009 is revving up to be one of the racing video games of the year. F1 2009 will be released in the US on 17th November, across PAL territories on 19th November, in the UK on 20th November and in Japan on 18th December, and is available to order now from Amazon.co.uk and Play.com. Both Amazon and Play offer exceptional customer service and Free delivery on all games, with fast delivery times. F1 Racing 2009 and other hotly anticipated games can all be found in the Wii Video Game Previews section.